The virtual Mars City base. Courtesy KieranTimberlake. If an architecture firm is lucky, it can hit two birds with one stone on a single project—for example, prioritizing both historic preservation and energy efficiency. But a team at KieranTimberlake, based in Philadelphia, is aiming for four ambitious goals with its pro bono project, the Mars City Facility Ops Challenge. Architects Fátima Olivieri, Efrie Friedlander, and Rolando Lopez teamed up with National Institute of Building Sciences (NIBS), NASA, and the Total Learning Research Institute (TLRI) to create a virtual working city on Mars—one that might reap multiple rewards. A primary goal for Kerry Joels (TLRI president and former NASA physicist) and KieranTimberlake was to bridge the skills gap for the future STEM workforce—particularly in architecture and facilities management. Another was to use the project as a test for VR architecture creation within KieranTimberlake. 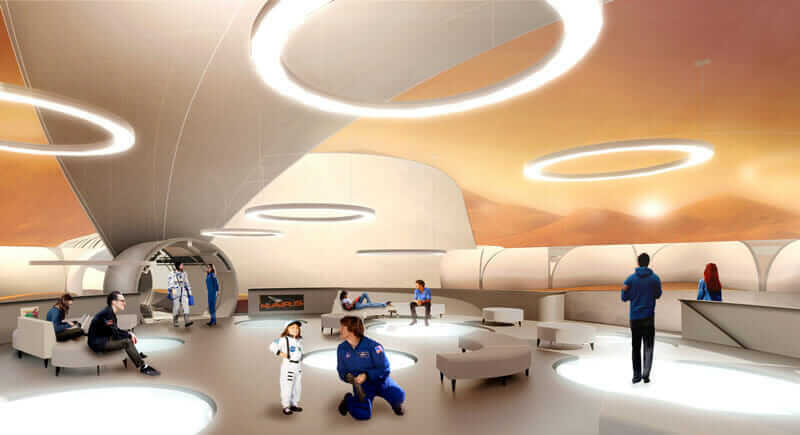 Third, Joels and the architects hope to get funding to build a Mars City–like space camp on Earth. 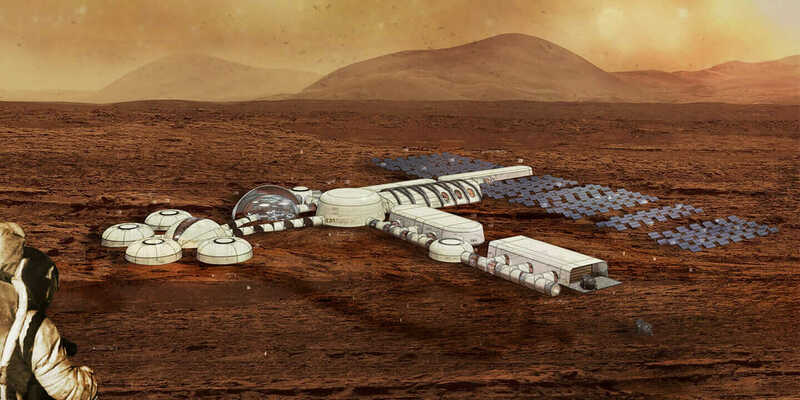 And fourth, their deep research and design efforts could one day inform plans for an actual Mars base. A public space on the virtual Mars City base. Courtesy KieranTimberlake. At an average of 140 million miles away from Earth, Mars is remote but still close enough that the prospect of colonizing it has been discussed for decades. Its climate is harsh and uninhabitable for humans, but the rocky terrain is familiar, and the known presence of water keeps colonization within the realm of possibility. Elon Musk is just one prominent thought leader who predicts the colonization of Mars within the next century. The Mars City project began in the 2000s with a grant from NASA to create a STEM learning program around Mars. With that grant, TLRI created a project called the Mars Facility Ops Challenge, a dashboard-based system in which student groups worked together to resolve the mechanical issues of a building on Mars. Once KieranTimberlake got on board, they upgraded the system to a fully realized BIM model (using Autodesk Revit) that incorporates light and nature, mechanical systems, living spaces, and more. Then they added considerations for building on the harsh living conditions of another planet. Architect Rolando Lopez giving a student a Mars City tour at the USA Science & Engineering Festival in Washington D.C. Courtesy KieranTimberlake. The architects also sought to advance the base beyond what people typically envision living in space would be like—such as the constrained confines of the International Space Station, with knob- and tube-filled corridors that have little connection to the outside environment and are geared more toward working rather than living or playing. Mars City, by contrast, emphasizes a balance between public and private spaces and incorporates architectural lessons learned on Earth about how people want to interact. Key to the project was the collaboration with the Gilbane Building Company and MEP engineers at Travis Alderson Associates, as well as input from the NIBS and the International Facilities Management Association. With their help, KieranTimberlake was able to include data on systems requirements for buildings on Mars, based on how they perform on Earth and transplant that to the virtual world. Mars City Simulation from KieranTimberlake on Vimeo. 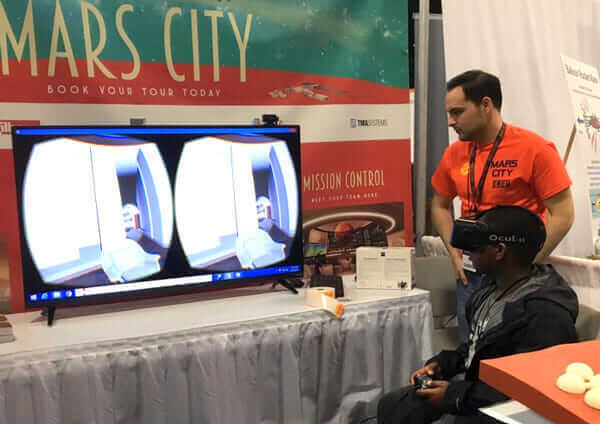 Mars City is currently an educational game that more than 1,200 middle- and high-school students have demoed (most recently at the 2017 NIBS conference). Using VR headsets, kids can walk through the space, respond to different maintenance scenarios, and test out solutions. To get the imagery right in the VR experience, the team worked with a combination of Autodesk Revit Live, 3ds Max, and Stingray, which allowed refinement of various aspects of the virtual world—such as the color of the terrain and details on the spacesuits. Determining materials required an understanding of material-science advancements, as well as an ability to forecast how the technology might evolve in the coming decades. A layout for the Mars City virtual base. Courtesy KieranTimberlake. 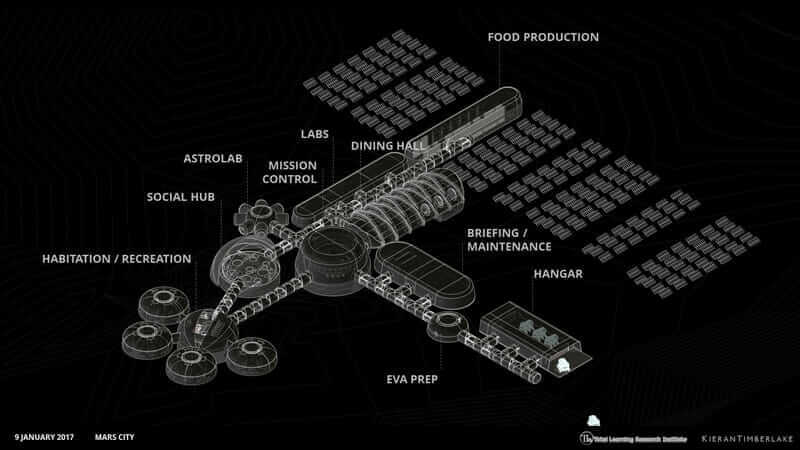 Hopefully, the next phase for Mars City will be a physical learning space here on Earth that will complement the virtual one. That would have to do until the foreseeable future, when people can actually start living and building on Mars and beyond.